G-Cash and PayMaya are Globe’s (PSE: GLO) and Smart’s (PSE: TEL) mobile wallets respectively, packed with many convenient functionalities and features for the tech-savvy Juan who wants to manage his money better. I’ll admit it. I’m a late bloomer when it comes to using GCash and PayMaya. To be fair, I never had much need for it before, since I primarily use banks in moving my (limited) money around – whether investments, loan repayments or just for daily needs. Whether it’s online transfer (within same bank) or the traditional ATM withdrawal then deposit in another bank, or through the use of checking accounts (anyway it’s now 1 business day check clearing). Then came the much improved bank transfers through Instapay and PesoNet, which made it much faster and easier to move your money around (at least for those who have bank accounts). Send and receive money on the go, wherever you are. But wait, it gets even better! That is, if you also have GCash and PayMaya, because here, all you need is a mobile number, and internet connection. These two are important ingredients in managing your finances. Liquidity meaning having readily available cash or cash equivalents (like cash in mobile wallets) to meet your daily financial needs (cash on top of your emergency fund, of course), without needing to sell illiquid investments or properties. And cash flow meaning being able to manage the money coming in (active and passive income) and the money coming out (expenses, debt repayments, etc), preferably more money coming in, of course. Herein comes the advantage of mobile wallets — these enable you to transfer money to other people and pay your bills through your mobile phone. Send and receive money faster, easier. This is not a paid advert, by the way. How I wish. Of course, the first thing to do is to create an account and get verified. Again, as long as you have a mobile number and internet, you can create an account for free. And GCash is not limited to Globe subscribers, the same way that PayMaya is not limited to Smart subscribers only. I used my Smart number to create accounts in both (yes you can use the same mobile number). Your mobile number effectively becomes your account number. Just follow the instructions on how to open an account. Why the need to get fully verified? So that you can enjoy all the perks and functionalities of both mobile wallets. Being fully verified means you have uploaded a valid government ID, completed the minimum required information, and passed the face-to-face requirement for account opening (this is required to prevent money laundering, just like in banks). Don’t worry about the face-to-face, this can be done by taking a selfie, or by having a brief facetime (video-call) with their account officers. Because we are now living in a hi-tech interconnected world. You can link your bank account to GCash and be able to transfer money from your bank to GCash. As in! For me, this is the easiest way to fund your GCash. Just use the “Cash In” >> “Online Banking” tab in GCash. Accepted banks are BPI, RCBC, UnionBank, AUB, Maybank, Metrobank, PBCom, PSBank. I was also able to link my BDO and UCPB debit cards to GCash. As long as you have access to the mobile / online banking of these banks and a debit card (Visa or Mastercard), you should be able to do this. Some banks may charge a “convenience fee” for the transfer / withdrawal, but so far, as of this writing, no charges for BPI, BDO and UCPB — which means I can withdraw from these banks, then proceeds go to my GCash for free. How does this work? It’s like paying online or paying for merchants in malls using your debit card. But instead of paying a merchant or a product, you’re paying your GCash account. And prior to transfer, the bank will send a One-Time Password (OTP) to your bank-registered mobile number, just to check that it’s really you who’s transacting. For security purposes. I find this very convenient, an additional alternative to Instapay and PesoNet. For PayMaya, you can also fund it using your bank account, but you have to do this using the bank’s mobile / online banking, then transact a “Pay Bills” to PayMaya Inc. Again, your account number is your mobile number. Juan can also send money directly from GCash to PayMaya via the “Bank Transfers” function of GCash. Just select send to PayMaya Inc. I’m not sure though if the opposite can be done as of this writing (PayMaya to GCash). One disadvantage of banks is that they have very limited branches where you can deposit. Especially in the provinces. And most are limited to business hours 5-days a week. This is the gap that mobile wallets try to address. In GCash, I mostly fund my mobile wallet through banks (because that’s where my active income and passive income usually come in) but you can also fund it via select supermarkets, department stores, pawnshops, convenience stores like 7-11, bayad centers, etc. There are much more of these nationwide and most of them are open 7 days a week, some even 24/7. Speaking of 7-11 convenience stores, I tried funding my PayMaya through 7-11 and it was so cool and amazing! I really felt techie. Just open the PayMaya app, click “Add Money”, choose “7-11”, enter the deposit amount, then it will generate a barcode. Show the barcode to the 7-11 cashier, they will scan it, then you pay the amount you want to deposit to your PayMaya wallet. Cool and fast huh? No more filling up of deposit slips! Inside the apps, there are easy-to-follow directions for each merchant where you want to fund your mobile wallet. So far I’ve tried withdrawing from BPI, BDO and UCPB accounts, proceeds get reflected on my GCash account in real time (fine, in a few seconds), and then I get to transfer these funds to BPI, BDO, Security Bank and Chinabank. So far. No more clearing required! Instant like instapay but without the charges. There are many more allowed banks. Note though that there are daily and monthly limits to sending, for your own security. I haven’t tried using PayMaya to send money to bank accounts. I don’t think they have this feature as of this writing. What they have though is the feature of paying bills to many merchants, including banks. Once, I tried to “bills pay” my deposit account number but I got an error message, so I suppose this just applies to real payables (like loans and cards). This is so cool! Pardon the tito in me who’s a newbie when it comes to QR codes. For select merchants that accept GCash payments via QR code, simply scan the QR code of the merchant, key-in the amount you need to pay and press send. Voila! You just paid. Show the proof of payment to the cashier. PayMaya also has QR code scanning so I suppose it works that way as well. I can now sell prepaid load because if I buy load using PayMaya, I get 5% off. So that’s instant profit margin right there. I haven’t tried buying load using GCash, though it has this same function too. I’ve always wondered why there are still so many people lining up in Bayad Centers when it’s much easier to pay online / mobile. Are there really so many people who still don’t live and transact via online / mobile? Lack of trust, awareness, or internet connection? Or technophobia? Just like there are so many Pinoy who remain unbanked? I hope they get to try these mobile payment solutions, see how easy and fast it is, for them to save more time and become more productive doing something else. If you’re running a business, especially online-based businesses, making it easy for your customers to pay you is a must. 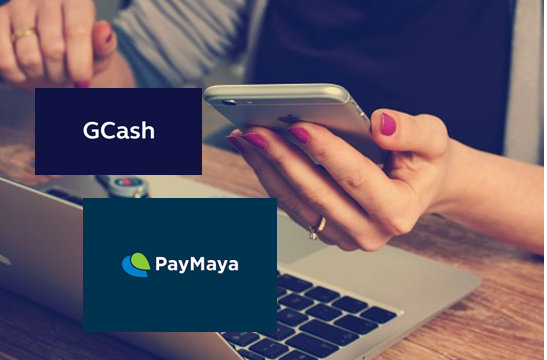 Having a GCash and PayMaya account can prove beneficial to your business. For our case, we have added this as additional payment channels, on top of banks and remittance centers for our online store. Likewise, you can also implement this even in your businesses with physical stores, all you need to do is generate a QR code for your GCash / PayMaya personal account. The more options for every Juan, the better right? You can readily access your GCash app using a mobile pin (M-Pin), which might be faster than pulling out your wallet. For PayMaya app, you can link your mobile phone’s screen lock to the app so you can just use the same screen lock format (PIN, iris scan etc) as long as you don’t logout from the app. You can also link GCash to your Facebook messenger, and be able to access basic functions from there. I heard BDO is also moving towards FB messenger linking for their mobile app. Of course, who doesn’t want rebates and freebies? Both mobile wallets are still at the early stages of market acceptance, there are still millions of people who don’t use it, that’s why GCash and PayMaya still employ heavy promotions and freebies for those who recently signed-up, for people to use their app more in purchases, bills payment, sending money, linking of bank accounts, for people to get fully verified etc. So take advantage of those rebates, freebies and promos. GCash also has referral incentives for those who get their friends to sign-up (send us PM on our FB page to get referral incentive). Basically, the mobile wallets are just another way to carry cash around with you, send money to family and relatives, pay bills and pay various merchants, etc. In the process, you use your cash without frequently withdrawing in the ATM. Likewise, since most of your spending and payments are cash-based, this should help you in managing your credit card balances as well. This is like you using your debit card more often (good as cash), than your credit card, except that your debit card now resides inside your phone. Many fall into the debt trap because of overused credit card, but they also use up their cash, with not much cash left when credit card bills become due. But since I use GCash more often, I also experience some downtime from the app wherein some services are temporarily not available, or my transactions don’t push through, even though I’m within the designated transfer limits, etc. But so far I haven’t lost any real money because of this. So far, it’s very safe. Just some inconvenience. The customer service of GCash also needs to improve because Juan can only reach them through FB messenger or email. There you go! Let us know other GCash and PayMaya functions that you find useful! Managing your finances is crucial to your richer life. A positive cash flow is a crucial, fundamental step so that you have extra money to build your emergency funds, your savings, and be able to invest eventually. Learn all these and more through our #10Steps to a Richer Life book. Download now! Previous: Previous post: Lend Money to SMC Global Power Through Bonds 6.8% p.a.